RadRichTextBox is a control that can display and edit rich-text content including formatted text arranged in pages, paragraphs, spans (runs), tables, images, etc. 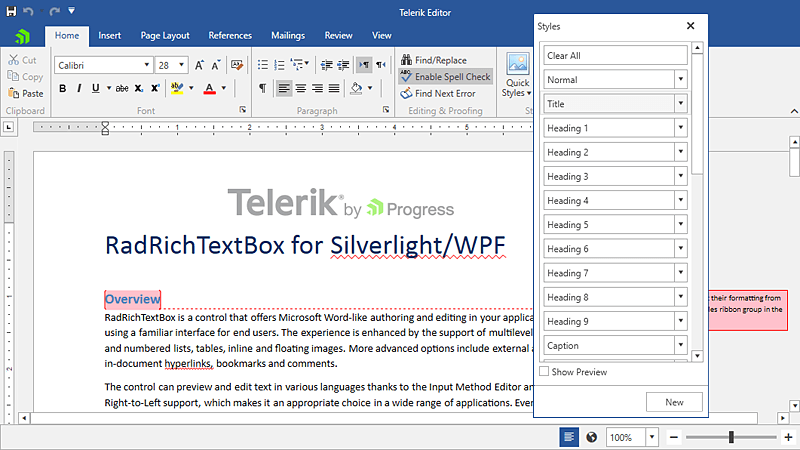 Rich Text Formatting Telerik RadRichTextBox control allows you to apply diffent rich formatting options. You can find some of them listed below. Inserting pictures, symbols, hyperlinks and custom UI elements For more information, see the InlineUIContainer article. You can also see the InlineImage and Hyperlink articles. Table support The control allows you to display and create tables. This feature includes also support for nested tables, merging cells, setting different RowSpan and ColumnSpan, tables with auto width, header row repeating on new pages, and more. For more information, see the Table article. Section Columns You can arrange the text into columns with equal or different width and set a separator between them. Find more information on how to use this feature in the Section Columns UI and Section Columns API articles. Format Painter The Format Painter feature enables you to copy the formatting of a particular content and paste it on other elements, so you can easily achieve the desired format. For more information about this functionality, check the Format Painter topic. Context menu A standard context menu is provided out of the box, but it can be easily customized or replaced with a user-defined menu. For more information, see the Context Menu article. SelectionMiniToolbar The rich text box component supports a floating toolbar that appears next to the selected element in the document. This feature is very similar to the one in MS Word, but can also be replaced with another mini toolbar. For more information, see the Selection Mini Tool Bar article. SpellChecker An extensible spell checking for different languages, using the built-in or custom dictionaries. For more information, see the Spellcheck article. Printing The printing feature allows you to use the native printing implementation of WPF. For more information, see the Guidelines for Printing with RadDocument article. Multi-level Undo/Redo Support Telerik RadRichTextBox provides multilevel Undo/Redo support which allows past actions to be reviewed and reversed.For more information, see the History article. Three types of layout There are three layout types supported by the rich text box conrol - Paged, Flow (as text in an HTML page viewed in a browser) and FlowNoWrap. For more information, see the Layout Modes help article. Multi-region selection The built-in multi-region support enables you to perform various operations for more than one selection simultaneously. For more information, see the Selection article. Rich-text clipboard The control allows rich text copy/paste from the clipboard. This includes rich text copied from applications like Word, OpenOffice etc. For more information, see the Clipboard Support article. Import/export Telerik RadRichTextBox allows you to load XAML, HTML, RTF, DOCX (rich-text) or TXT (plain text) into the control, you can format and edit it and then export it back to any of the above formats. The control also supports export to PDF. For more information, see the Import/Export article. Headers and Footers RadRichTextBox supports headers and footers in its document. For more information, see the Headers and Footers article. Track changes Support for tracking changes as formatting changes, adding and removing text, images, hyperlinks, tables, etc. This feature is useful when different people are working on the same document. For more information, see the Track Changes article. Bookmarks The control provides easy retrieval of previously marked parts of the document. For more information, see the Bookmarks article. Comments RadRichTextBox offers the ability to add text to the document which is not inserted directly in the page. For more information, see the Comments article. Document protection You can define editing restrictions in the document for a set of users and groups. For more information, see the Document Protection article. Mail merge The control makes populating a template document with data easy. For more information, see the Mail Merge article. Custom annotations You can extend the document model in order to serve specific needs. For more information, see the Annotations Overview article. Footnotes and Endnotes This feature is usually used to show the source of a material or add an explanation. For more information, see the Footnotes and Endnotes article. Bibliographic references This feature can be used for referencing a source in the form of text or pointing the source of a citation. For more information, see the Bibliographic References article. Cross-references References to a Heading, Caption or Bookmark can change along with their source. For more information, see the Cross-Reference article. Captions for tables and figures Images, tables, etc. can now be easily labeled. For more information, see the Captions for Tables and Figures article. Document variables The control provides a mechanism used for storing information in the document. For more information, see the Document Variables article. Code blocks This feature allows you to add source code fragments in a document. For more information, see the Code Block article.